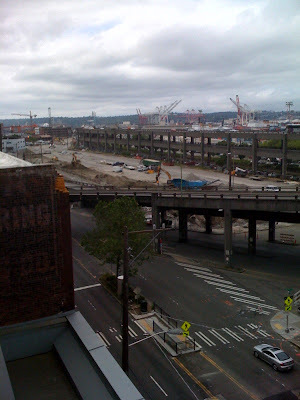 WSDOT recently demolished a series of buildings on the "WOSCA" site - a parcel of Land they lease from Urban Visions. 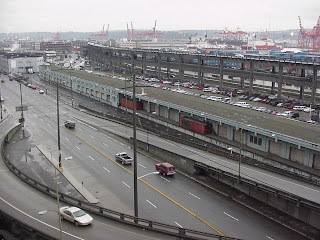 This activity is in preparation for the viaduct utility relocation, as well as staging for future viaduct work. If you drive by on 1st Avenue, you really get a feel now for this site's development potential. Below is a 'before' photograph taken from the Roof of the Provident Building, and an after photograph taken today from the Reedo Building rooftop. I will work on getting a better quality photograph up next week.